Ever wonder how that handyman you hired always seems to know where to put that nail or screw into the wall? Well the answer is in the "Rule of 16"! 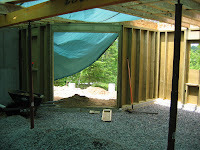 Virtually all houses, and in our case cottage, are framed using a standard distance of 16 inches from the center of one stud to the center of the next - Always! This means you can always depend on where the studs are as long as you have a starting point of reference for the first stud - and that is usually in the corner. There are exceptions to the rule. There can be more studs, like trimer and king studs around doors and windows, but these are always extra studs which may not conform to the rule of 16 because the window or door just doesn't conform. In the above picture one set of king/trimmer studs happen to fit in to the 16 inch center pattern and the other doesn't. Can you determine which? 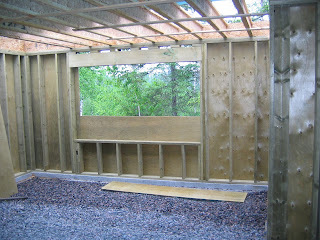 Another portion of the lakeside wall showing the framing for the patio door, and the window framed for the future basement bathroom.